Attorney Daniel Lehnert is holding an lectureship in legal areas of Criminal Law, Criminal Procedural Law and Police- and Regulatory Law. He strongly enjoys sharing his knowledge with a specialized audience and with his students. The academic discussion provides Attorney Daniel Lehnert with new inspirations, for which he is very grateful to his listeners. In addition, a lectureship at a law school is promoting the ability to present complex issues on a simply and clearly basis. Rhetorical skills are developed deepened. Therefore Attorney Daniel Lehnert is working as well as a proofreader for final semester exams since 2011. On weekends he is giving exam-courses in a variety of legal areas as shown above. If you are looking for a contributor for presentations or want to give a teaching position at law school please contact Attorney Daniel Lehnert. 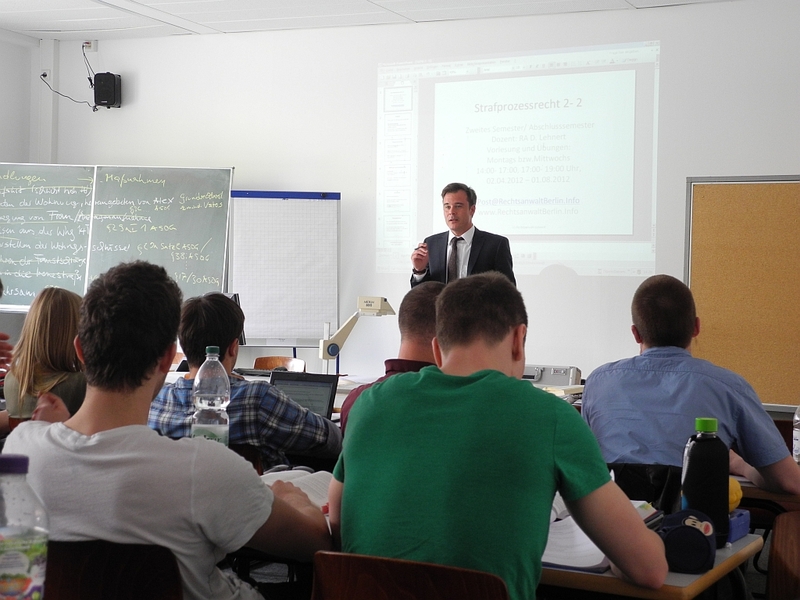 Currently: Lecturer at the Berlin School of Economics and Law.